There may not actually be balloons and banners greeting trail-clearing volunteers and construction equipment in the next few months at Radnor Lake State Park, but Ann Tidwell and other longtime users of the hiking trails there are still in a mood for celebration. 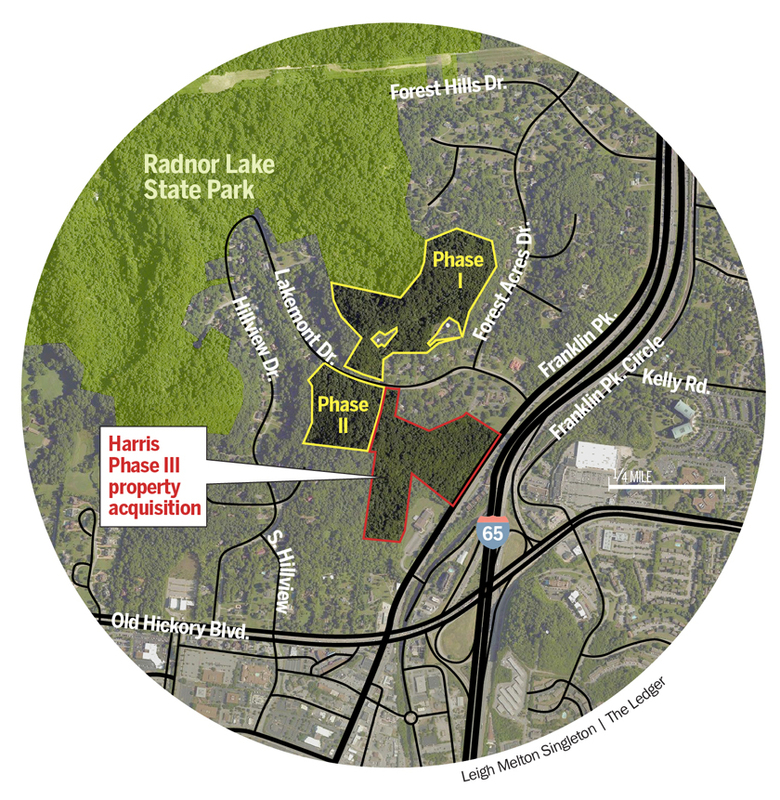 The state finalized the purchase of 89 acres – increasing the size of the park to approximately 1,400 acres – in January, allowing it to move forward with plans to build a new trail and parking lot at Harris Ridge in the southeast corner of the facility along Franklin Pike. The new site, located one-half mile north of the intersection of Franklin Pike and Old Hickory Boulevard, will include a 3-mile hiking trail (connecting Franklin Pike to Otter Creek Road), a parking lot with space for 100 cars, new restrooms, security cameras and trail information. 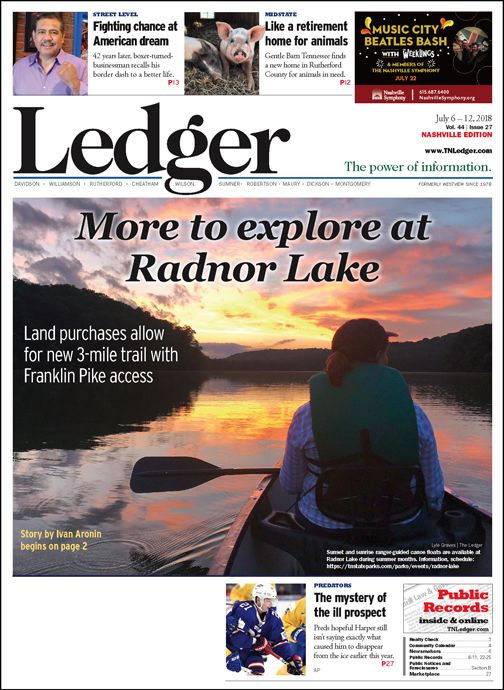 The project – expected to include a swinging bridge and a nod to the site’s railroad history – will increase Radnor Lake’s combined trail distance to nine miles. Kim Schofinski, the deputy communications director for the Tennessee Department of Environment and Conservation, says the state is currently completing a topographical survey for the new parking area, which is being designed and built by TDOT. Radnor Lake State Park Manager Steve Ward predicts the project has a chance to be finished by the end of 2020. When: New trail and parking area expected to be completed by end of 2020. Where: Half-mile north of intersection of Franklin Pike and Old Hickory Boulevard. Cost: $4.5 million for land acquisition. Additional costs determined after parking lot and trail designs are complete. What you will see: Chestnut oaks, poplar oaks, swinging bridge over Lakemont Drive, historical marker for Franklin Interurban Railway. The next step in the project, Ward adds, is organizing public work days to clear the trail, and he plans to lead some hikes through the area starting next spring. His staff has expressed a lot of enthusiasm to be involved in that clearing effort, he says. The land purchase cost approximately $4.5 million total in separate transactions for three tracts, increasing the state park’s watershed by approximately 27 acres. The state used $2.6 million of its funds to pay for the land, Schofinski says. The Friends of Radnor Lake organization raised approximately $1 million, and the rest of the money came from foundations, other sponsors and donations made during 46 guided hikes, Ward explains. Tidwell is a former president of the Friends of Radnor Lake and a current member of the organization’s land committee, which helped to obtain the property. “I walk there (at Radnor Lake) nearly every day, and it just makes your day,” Tidwell says. “It (a new trailhead) is very much needed. The parking lots get full, and people who want to go can’t go, and that is very frustrating for a lot of people. The Harris family, longtime supporters of the state park, agreed to sell the land to the state below market value to make the new trail possible, Ward explains. The new Harris Ridge Trail will intersect with the current Lake Trail, creating an 8-mile hiking loop that will encircle the lake. The new trail will have the same restrictions – no dogs, no running and no bicycles – as the Ganier Ridge, South Cove, Lake and South Lake trails. A family stops to admire an owl in a tree along the Otter Creek Road trail near the east parking lot. The state finalized the purchase of 89 acres of land in January, increasing Radnor State Park to approximately 1,400 acres. 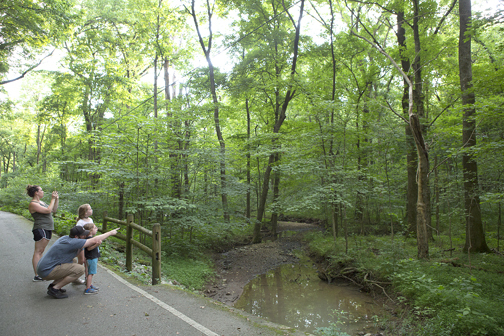 During a 45-minute driving tour of the southern part of the park recently (including Ward stopping his truck to casually lift a rat snake off the trail and back into the woods with a hooked tool), he described the two features of the new trail area that make him impatient to get the trail completed – a swinging bridge and honoring Radnor Lake’s railroad history. Ward has a plan for a swinging bridge that will take the trail about 30 feet over Lakemont Drive in a residential neighborhood. The bridge will add uniqueness to the trail as well as provide safety – no hiking across a street – and trail aesthetics. Ward adds he is currently working to raise the $200,000 needed to cover the cost of the bridge. The first steps onto the new trail will be a pure Nashville history lesson. He recounts that when the trail planning began, part of the Franklin Interurban Railway tracks were discovered on the site. The Franklin Interurban Railway trains took passengers and freight between Nashville and Franklin – with a station in Brentwood near the new trailhead – from 1908 to 1941. Signs direct hikers to two of the existing trails, both on the north side of Radnor Lake. There also are two trails on the south side, as well as the pedestrian roadway. Ward says having part of the former rail line as part of the trail will make the trail-clearing process more efficient. Radnor Lake was created in 1914 on land purchased by L&N Railroad to supply water for its steam engines in south Nashville. Ward says a 16-foot limestone cistern was found at the trail site, adding another historical attraction for visitors. The new trail will go from a 750-foot elevation at the trailhead to 1,110 feet at its highest point. The Ganier Ridge Trail in the north section of the park also reaches 1,100 feet. The new trail will include some of the largest chestnut oak trees at the park and some excellent views of some tulip poplar trees. “If you like the Ganier Ridge Trail … well, this new one is like Ganier Ridge times two for enjoyment,” Ward points out. Part of the 89-acre addition includes 10 acres purchased to increase safety on the trail, allowing it to meander to the top and prevent more homes being built around the new trail. “If you went straight up that slope you would need an escalator,” Ward continues. “And you are three times more likely to hurt yourself, roll an ankle or something, coming down a straight slope than going up. Although I-65 is also visible from parts of the new trail site, Ward says the design will help hikers avoid seeing the interstate. Mary Glynn Williamson, another longtime Radnor Lake hiker, has seen difficulties with crowds and parking, as well. 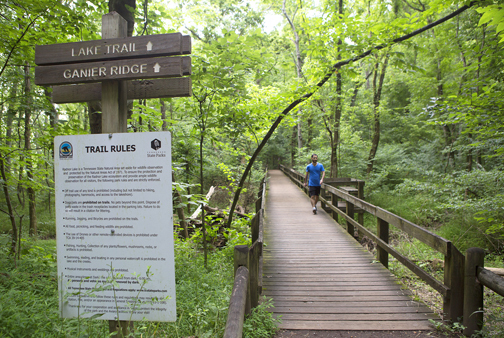 Radnor Lake had approximately 1.6 million visits last year. “I am very happy for Radnor to have new access anywhere in the park,” says Williamson, who adds she has been using the hiking trails there since the 1970s. Williamson likes to hike at Radnor Lake during early mornings – including some sunrise hikes – because her hobby is photographing nature. The new trail site will help to relieve the parking pressure at the rest of the park not by the size of the parking lot, but just by being open. Ward says with office buildings and a hotel near the trailhead, there is an opportunity for hikers to begin their walk without driving to the trailhead. “We want to give people the option to hike to Radnor Park,” Ward explains. “This new trail aligns perfectly with that. This is not really a trail for a first-time visitor to Radnor.